You own an HVAC company and during the hottest time of the year, your business starts getting busy. I worked for a company that did new HVAC installs and sure, the summers were busy but what about the other slow months. I helped grow the marketing structure for that company to consistently get new install clients for the slow months. These 7 HVAC Marketing Strategies will grow your business and keep the leads coming in month after month. Before I dive into the 7 strategies for marketing Air Conditioning companies. I want to make sure you understand that Marketing on any level has to be consistent!!! Marketing is like working out at the gym; if you work out 3 to 5 times a week you will start seeing the difference and reap the rewards from your hard work by looking good and feeling healthy. You must consistently do Marketing 3 to 5 times a week to see the results and grow your business by capturing new HVAC leads that will turn into clients. 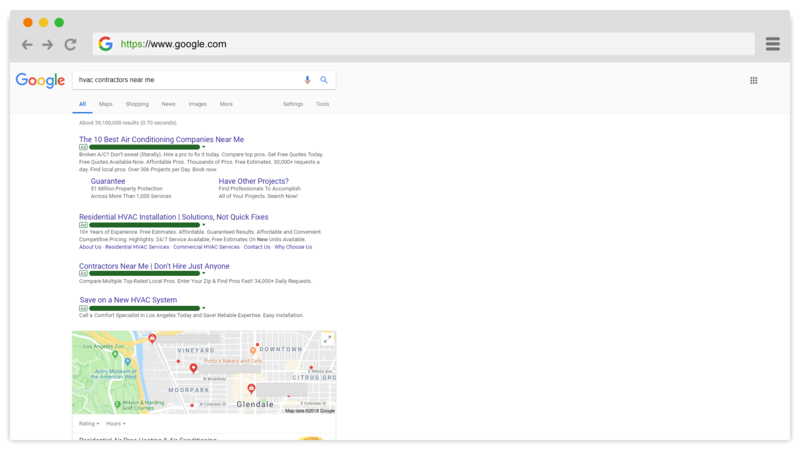 Google PPC ads for HVAC leads is probably one of the most popular and fastest way to start getting leads online for your HVAC marketing efforts. 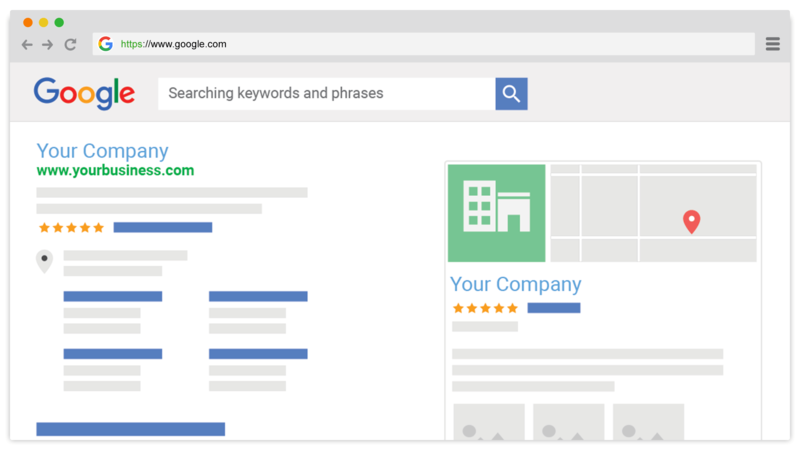 Potential clients will visit Google and search for keywords like “HVAC Contractor Near Me” and if you are buying PPC ads and your campaigns are set up properly your ad should appear within the top 4 results. This is a free service that Google offers. The search results show up as the local three pack. If you are listed within the top 3 this will send you a decent amount of leads and traffic to your website. The ranking factors for the local three pack is based on several key factors including but not limited to reviews, citations, location, and other several factors. Facebook and Instagram can drive a ton of leads to your HVAC business. Social Media is here to stay and can help your business with branding and lead generation. Several of our HVAC clients generate a large percentage of their leads from Facebook and Instagram. 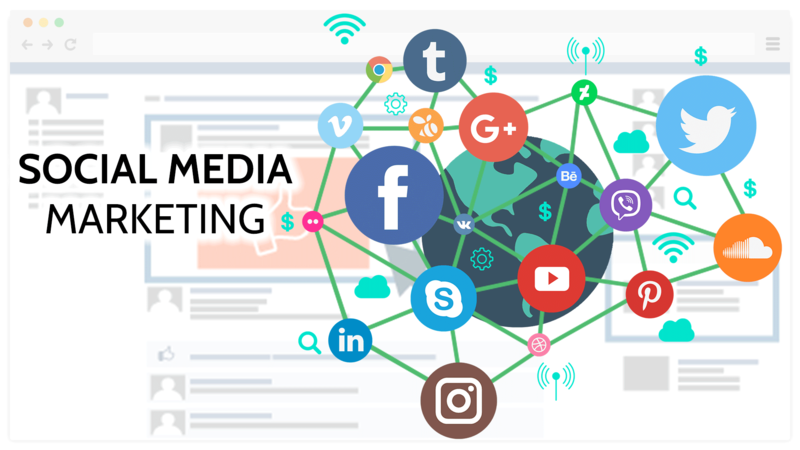 These social media platforms help HVAC companies get the word out about their services and specials they are offering by targeting certain demographics and locations. SEO is not dead! Only the Marketing people that don’t understand SEO say it is dead. SEO involves so many ranking factors these days. Ranking factors include on-page SEO, link building, citation building, content generation, content marketing, social influence, social presence, and some other factors. 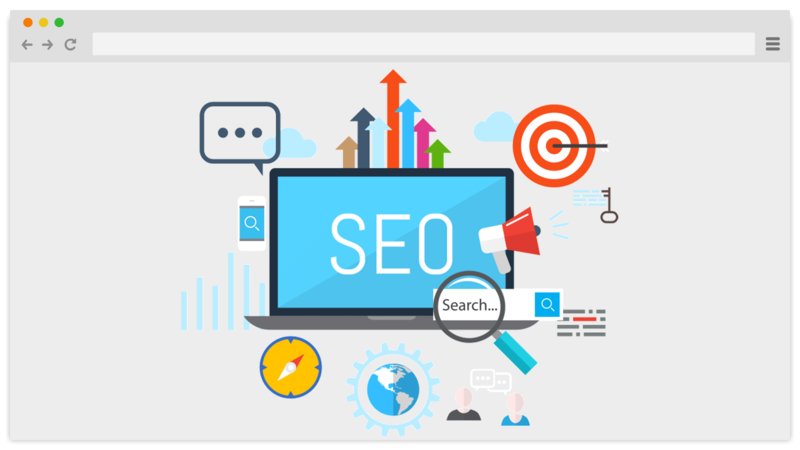 If done right SEO can bring your HVAC company new business and help you grow and achieve your marketing goals. It is no secret that a large percentage of consumers look at reviews online before making a decision on which company to use. 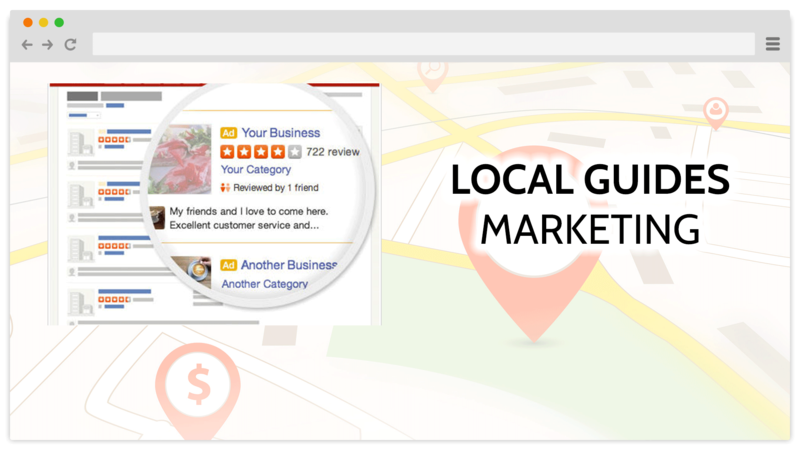 Yelp is a great source of lead generation for your business. We believe every company needs a presence on Yelp and should spend some money advertising on the Yelp platform. HVAC companies need to be listed on Yelp and you, as an owner of the company needs to be active with Yelpers and respond to requests and messages in a timely manner. Videos are very important. 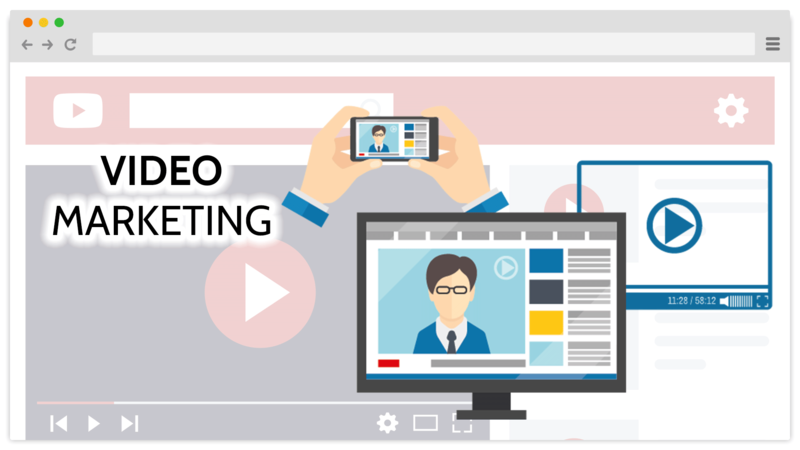 Videos establish a personal connection between you and your potential clients. A simple about our business video will help your company get exposure and traffic. YouTube is a great source for uploading and hosting your videos and will bring traffic to your website. Content Writing, Video Content, Infographics, and Social Media Posts, are all content that can drive traffic and business to you. Once you produce content for your HVAC business you can market your content on Social Media and your company blog on your website. The content can be informative about you, your services and other pertinent information. 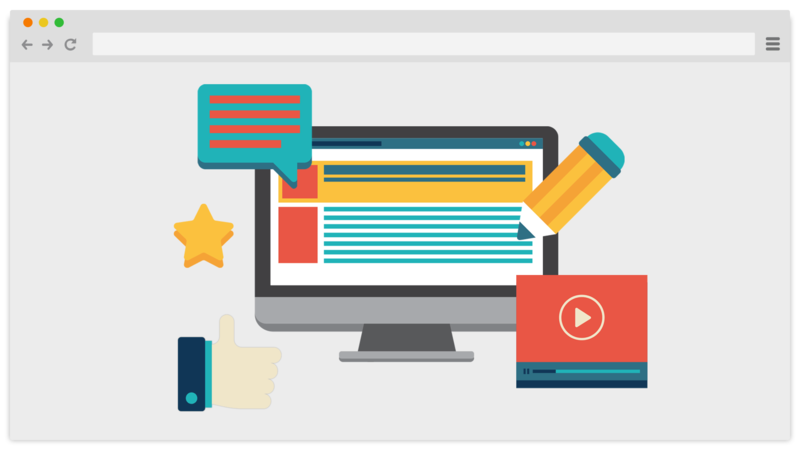 HVAC Content Marketing will also help out your SEO efforts for your website. 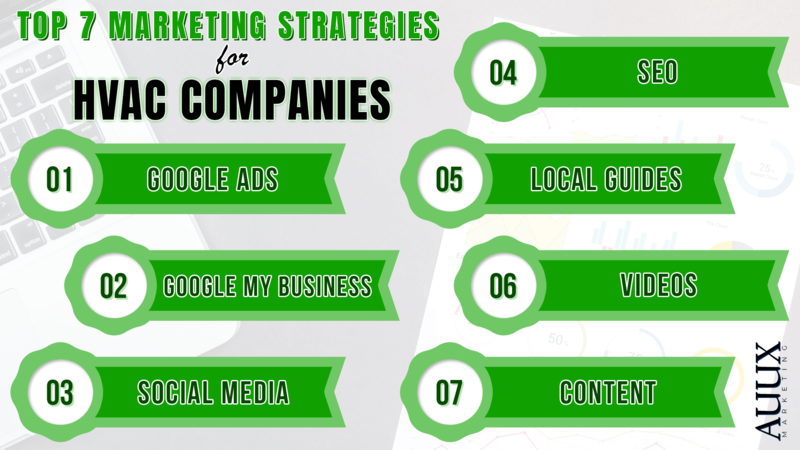 In conclusion, these 7 Marketing Strategies for your HVAC business and website will all help in growing your HVAC online business. Is any one of the 7 strategies not important or can you do without one or the other? Maybe, but if I were an owner of an HVAC business I would do as much as possible to get my business in front of the potential customers. These 7 strategies take time and effort so start today and slowly set and get to your goals. We at AUUX Marketing provide HVAC Marketing and Website Design for companies of all sizes. Contact us today for your FREE HVAC Marketing Analysis.